Through a statement to the media, the State Police of Albania provided details of the megaoperation, which ended with the arrest of 31 people, including a police officer dealing with clandestine trafficking from Albania to European countries and United States. Among other things the police emphasises the fact that four labs used to fabricate false documents are seized. In addition to the arrests, a considerable amount of cash and an automatic weapon as well as documents from identity cards to scanners and photocopies were sequestered in the quality of the material evidence. "The Police operation 'The Wrong Way', the criminal group with 36 suspected members is hit. State Police in cooperation with the Tirana Prosecutor's Office of Serious Crimes and other enforcement authorities in the country, and with the assistance of diplomatic service security agents attached to the US Embassy (DSS), finalised successfully the operation codenamed 'The Wrong Way." 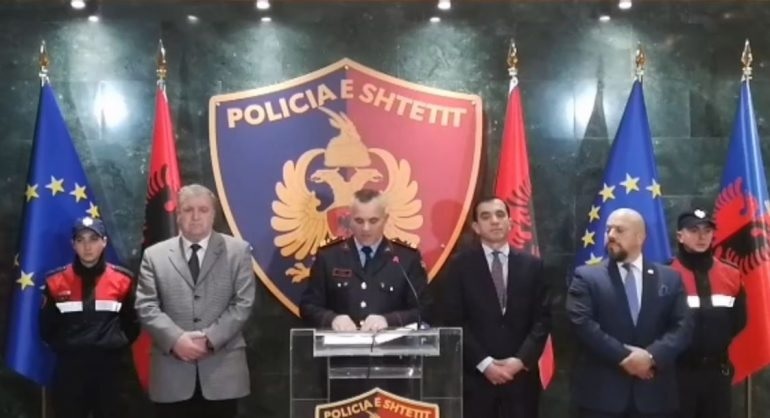 During this operation, 31 Albanian citizens are arrested, among them 1 police officer, and 4 other citizens are declared wanted. 6 of the arrested got the security measure "Home Arrest". Meanwhile four labs are seized for forgery of documents, also various equipment such as scanners, photocopies, a large amount of cash money, certificates, ID cards, a considerable number of documents and automatic firearms. The arrested persons are: A.Sh., 46, from Tirana SK, 60, from Tirana RH, 43, from Gjirokastra DS, 35, from Gjirokastra LM, 61, from Përmet AZ, 48, from Delvina EO, 52, from Saranda K.Gj, 52, from Korça AD, 54, from Korça PB, 59, from Vlora G.Sh., 32, from Tirana BM, 52, from Kruja AK, 35 aged 46, from Vlora AE, 47, from Sranda EM, 31, from Fieri IM, 59, from Gjirokastra S.Ç, 55 years old, from Gjirokastra MM, 31 years old, from Mallakastra Gj. from Lushnja (flat was found Kalashnikova firearm) DT, 50, from Elbasani BH, 45, from Berati Ç.T., 48, from Gjirokastra V.Gj., 50, from Gjirokastra M.Sh., 46 years old from Gjirokastra VG, 54, from Saranda EB, 28, from Tepelena (Police Officer) Sh.Sh., 65, from Saranda (house arrest) EM, 56, from Fier (house arrest) JG, 69, from Delvina (house arrest ie, AL, 52, from Kruja (house arrest) IM, 35, Tirana (house arrest) X., 57, from Vlora (house arrest) The operation was conducted in cooperation with the Local Police Directorates in Tirana, Durrës, Elbasan, Korça, Fier, Vlora, Berat, Gjirokastra, where about 250 police forces were involved. The operation took place in several cities of the country: Saranda, Delvina, Gjirokastra, Tepelena, Përmet, Vlora, Fier, Berat, Lushnja, Kruja, Elbasan, Tirana, Korça, etc. This operation was conducted following criminal prosecution "272", based on investigations and information provided by the State Police, under the direction of the Serious Crimes Prosecution Office and in cooperation with domestic and foreign law enforcement agencies, where the part was hit another of the structured criminal group that continued the post-conflict operation in 2018. From the investigative actions carried out in function of this criminal proceeding, it resulted that the above-mentioned citizens in cooperation with each other within the structured criminal group provided persons who were interested in travelling to EU countries as well as those citizens who were banned from entering in the SCHENGEN area. The members of this criminal group, as provided the citizens with counterfeit identification documents, unlawfully created travel conditions to EU countries, airlines or land lines, and then to the US, Canada and The United Kingdom, paying a considerable sum of 10,000 pounds to the United Kingdom, up to 20,000 euros for the US and Canada. This criminal group has equipped with forged documents even seven citizens with high social risk. The launching of the persons with forged documents was done by Albania, Montenegro, Italy, Greece, France and Norway. In the light of this investigation, several episodes have been documented while the above persons have falsified travel documents and have provided help for illegal crossing of borders to some citizens.